25 MILWAUKEE Shockwave Impact Duty #2 PHILLIPS Power Bits 2"
Flute Length: 5/8", 21/32", 47/64", 29/32", 63/64", 1-1/64", 1-3/32", 1-1/8", 1 Shank Dia. : 1/4"
There are 1,026 items available. Please enter a number less than or equal to 1,026. 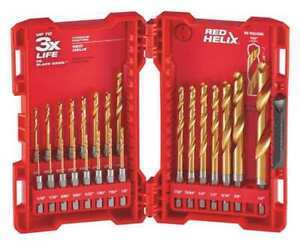 I am always in search of good quality "hex" bits for my impact driver because I always breaking the bits that I do purchase. However, I believe that I have now found a much higher quality and more durable drill bit in the Milwaukee brand. The price was quite fair and the delivery was very fast. I even ordered a second set after a saw the quality and experienced the performance of the item. I highly recommend this item. I drilled holes in every one of my ex wifes tires in record time before the cops showed up. Highly recommended!!! I do a lot of wood work, so I bought this in mind. When assembling a deck, table or shelves, use mostly #8 screws. Need to use a 1/8" drill bit to predrill the holes. The problem with that is in this set the bit is only 1 1/8" long & a 2x2, 2x3 & 2x4 are 1 3/4" thick. This makes this set for the purpose that I purchased my primary use of it, of no use to me. If all I did was metal work, these would great & indispensable. Also another reviewer stated that because he was a elderly gentleman who has arthritis, that he had to use a pair of needle nose pliers to remove the bits from the holder. Hell, I am not that old & I certainly don't have arthritis. I have to use a pair of pliers to remove and replace them back. DO NOT USE YOUR FINGERS!!!!. They will slice & dice them. So I have a nice set of drill bits for the few times I need to drill metal. My old Craftsman drill bit 1/8" drill bit is 2 1/4" long, but getting dull. These Little bits worked very very well considering the price. They lasted longer than more expensive bits and did a very good job on taking the impact while drilling. Easy on and off the drill also.